Modern Handcrafted Brown Leather Wallet for Men, "Executive Brown"
Sanchit transforms brown leather into a handsome and practical wallet for men. Minimalist in style, the modern billfold features two open compartments for bills, three pockets for credit cards and driver's license, plus two more multi-purpose pockets. The coin purse closes with a snap press button. 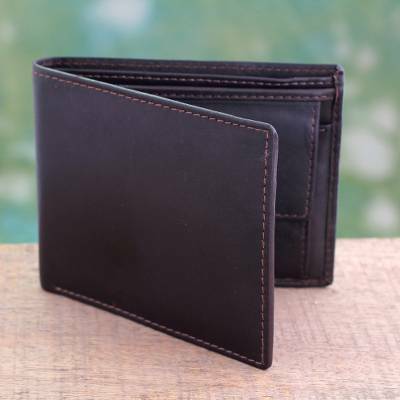 You can find men's leather wallet 'Executive Brown' by Sanchit in handbags categories such as Leather Handbags and Wallets Handbags. Enjoy exploring these sections for other Novica treasures.